Ginkgo biloba is a very special and old species of seeding plants. They grow fast and are incredibly strong trees. Four Ginkgo biloba trees in Hiroshima were reported to survive after being bombed. 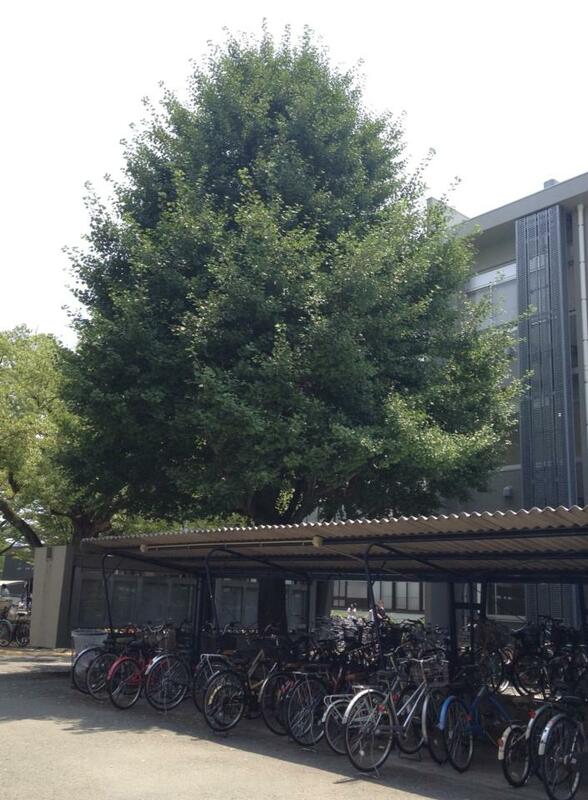 The four trees are still now living and growing well in Hiroshima. The origin of the group’s name came from a mistake of the first western study who saw it for the first time in Japan, even though the origin of the plants was found in China later. The western study read the Chinese character 銀杏 – the plants’ name as “gin-kyo”. That is a possible way to red it, but it was in fact read “i-choh” in Japanese. The pronunciation “i-choh” in turn is not the way how the character 銀杏 is originally read in Chinese. “i-choh” came from “鸭脚” (Pinyin: yajiao) which means “duck’s feet” and it describes the leaves’ shape and it is not even ever the name of the trees in China. Ginkgophyta is a division of plants, which are believed to be derived from “seed ferns” (ferns that bear seeds, literally), diversified on our earth a long time ago (during Jurassic, 190 million years ago) and most of the species went extinct prehistorically. Only Ginkgo biloba from the group stay extant in a small area in China and for this reason, it is called “living fossil”. 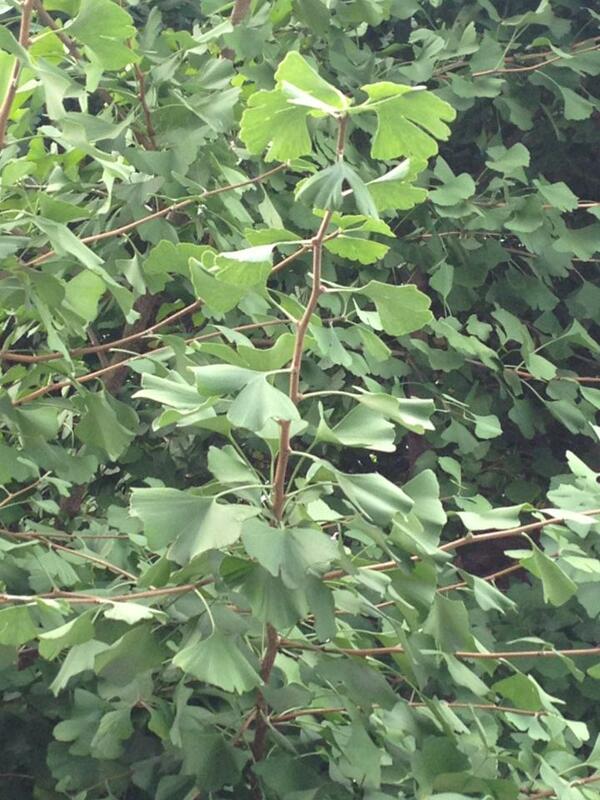 Ginkgo have many obviously distinct features so the plants can be easily identified. The plants are large and richly branched. They can grow very high, typically 20m ~ 30m and possibly 50m. With large seeds, the young shoots can survive well from competitions with other plant species during young growth stage. It is said that young shoots will grow straight upward to 10m before they elongate side branches. There are two different kinds of shoots that can be found on a Ginkgo biloba tree. The elongating “long shoots”, during their first year of growth, produce a series of leaves from widely separated nodes. From the next year, grow on the long shoots the “spur shoots” (or short shoots) which can only grow in length 1 or 2 cm per year. Each spur shoot produces a cluster (up to 16 leaves) of leaves every year. The leaves, as how its Japanese name tells, have the distinct shape of “duck’s feet”. It is also described as fan-shape. The leaves’ veins devide into two, which is what “biloba” means. The lobes of leaves which come from seedlings or long shoots are more deeply bilobed than those which come from spur shoots. The plants are deciduous, that means leaves survive only one growing season. They are initiated after severe winters, perform photosynthesis until they turn into beautiful yellow in autumn before falling out of the trees’ bodies. The plants are dioecious, which means each tree has either sexuallity of male or female. The seeds grow only on the female tree. Because of the fact that the seeds release stinky smell, male trees can be more favorable to be planted as ornamentals near big streets. Ginkgo do not have true flowers. Flower-like organs grows on both male and female trees in spring along with leaves from spur shoots. After pollination in March or April (right after initiation of leaves), it takes about 5 months until fertilization, which is around August. Sperms grow from pollen within the female gametophytes. Ginkgo is said to be one of those plants that have largest sperms among plant kingdom. Fertilization is perform around August when the female gametophytes are mature. Ginkgo biloba grows in well-watered temperate area. As it is cultivated all over the world, it can be found even in the Southern hemisphere in Australia now. From a small area in China, it has been cultivated in many parts of the world for it beautiful leaves in autumns. In Eastern Asia, Ginkgo biloba trees are considered sacred trees in Buddhism. It is cultivated in temples’ garden widely among Korea and Japan. Seeds of Ginkgo biloba are edible. But they can become poisonous due to overeating. Ginkgo biloba produces many kinds of chemical compounds that it played an important role in China herbal medicine. Also, only recently it is seriously studied by western studies. Ginkgo biloba can be seen widely in Japan, from along sides of big main streets in big cities to the countryside, in temples, school grounds or in private gardens. Thank you for letteing me read about good knowledge. I was surprised when I knew why Ittyo is nemed on Ginkgo biloba.By only mistakes of people,a life,s name was decided.This pointv was interresting for me. I want to know about other plants. I didn’t know it is near the university. I want to see around here. I knew about these plants. I want to know many things.